Having seen the Encores! production of Merrily We Roll Along, I feel as if I’ve gone through a musical theatre lover rite of passage. I had known of the show and was vaguely familiar with the plot and score but there’s nothing quite like seeing a top-notch production of a show to really hook you. Merrily We Roll Along is an inspirational cautionary tale that follows three “old friends” on their journey from wide-eyed dreamers to hardened, jaded adults – but it’s told in reverse. 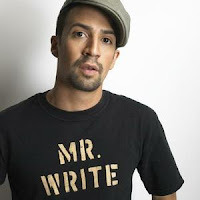 When we meet Franklin Shepard (Colin Donnell), Mary Flynn (Celia Keenan-Bolger) and Charley Kringas (Lin-Manuel Miranda), they are showbiz and publishing veterans in their forties and they can barely stand to be in the same room with each other. Years of professional infighting (Frank is a composer and Charley his lyricist; Mary is a writer) have given way to the dissolution of what seemed to be an unbreakable bond. It’s an absolutely devastating story, and by telling it in reverse, Stephen Sondheim and George Furth craft an emotional masterpiece. To tell this story in a traditional linear way would make for a really depressing and unsatisfying experience. Watching someone deteriorate is not particularly engaging. But rolling backwards is terrific. To know how the story ends and then see how everyone got there makes it a richer experience for the audience. Telling the story backwards also makes certain moments much more powerful. For example, when Frank and Charley are in their early twenties toward the end of the show and they play “Good Thing Going” for “fancy producers and industry people,” we are moved by the tragically prescient nature of the song. These young kids have no idea what’s ahead of them but we do. We know that this good thing will be “going, going, gone,” and we are all the more sympathetic to the characters because of it. From a craft and structure perspective, it’s also interesting to realize how certain songs and moments can only work by telling the story in reverse. The show ends with “Our Time,” in which Frank, Charley and Mary dream their dreams. If this was the first song in the show, if we met these three when they were 20 and on a roof top dreaming of their future, it would be really sappy. We’d probably roll our eyes. But because of Sondheim and Furth’s bold choice to tell the story this way, “Our Time” is almost elegiac. There’s not a trace of sappiness, and it wraps up the journey in a most devastatingly beautiful way. Rolling along for the journey was a superlative cast. Elizabeth Stanley (Million Dollar Quartet) was seductive and modern as Gussie Carnegie, revealing layers in what could easily be a throw-away, stock-character role. Betsy Wolfe excelled as Beth Spencer, Frank’s first wife. Her interpretations of “Not a Day Goes By” (first in act one as the reprise, then the full song in act two) are rightly very different but very honest. As the songwriting duo’s lyricist Charley Kringas, Lin-Manuel Miranda (In the Heights) was one-third hilarious, one-third raw nerves and one-third truly impassioned artist, a wonderful mix that revealed itself over time. His manic rendition of “Franklin Shepard, Inc.” was one for the ages. Celia Keenan-Bolger (Peter and the Starcatcher) as Mary Flynn: Wow. The funny, the sad, the sorrow – they were all there in her performance. She has a tough role, but Keenan-Bolger brilliantly played both the hurt and pleasure inherent in being the third wheel. Mary Flynn strikes me as an underwritten part – Mary the character serves a purpose but on paper there isn’t much to her. Keenan-Bolger brought richness and pathos to the character, making the demise of the trio of old friends all the more excruciating. 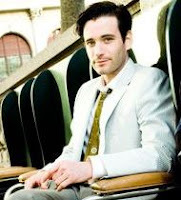 And leading the pack as Franklin Shepard was Colin Donnell (Anything Goes). He was so strong playing against his natural charisma and charm. There are moments throughout when he’s sitting quietly at the piano. Subtly but surely, Donnell expresses Frank’s struggle between passion and pragmatism. Pouring his heart and soul into the performance, he drew a touching portrait of the artist as both a young and not-so-young man. View production stills on Broadwayworld.com. This Encores! 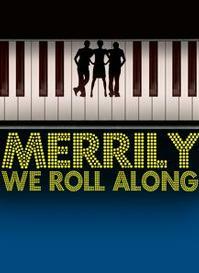 production of Merrily We Roll Along concluded its limited, two-week run on Sunday, February 19. Visit nycitycenter.org to learn more about the Encores! Great American Musicals in Concert series and to purchase tickets to the next production, Pipe Dream.